Happy Science, and their relationship with anime. This is a post about Happy Science. You may not have heard of them. They are one of many ‘Japanese new religions’ (or Shinshukyo) that still operate. No way are they on par with the likes of doomsday cults like Aum Shinrikyo (now known as Aleph). It would be wrong to call them a hippy cult, but peace, love and understanding is essentially what they are about. Believers and converts are required to follow a set path in life, and must have “the aspiration and vision to seek the way and contribute to the realisation of love, peace and happiness on Earth”. The founder and leader Ryuho Okawa (the reincarnation of supreme deity El Cantare) claims to channel spirits such as Christ, Muhammad, Buddha, Confucius, among others. However, while the group doesn’t aim for monotheism like most major religions, it recognises many gods…I presume one idea of this is that they see no need for religious war. So why on earth am I writing about them here? I’m pretty sure that it was when I was looking into how some religious organisations use anime as a medium to show people their beliefs (and whatnot). I first came across the shorts made by Aum Shinrikyo/Aleph, showing founder Shoko Asahara using supernatural powers like levitating and phasing; the shorts are still scattered here and there on YouTube. But this didn’t directly lead me to Happy Science, though. I’ve had this interest and fascination of religious groups and cults for a good long while; not at all joining them, but instead I think about what drives people from mainstream religion to such beliefs that, to some, could be seen as threatening to everyday life. I researched some more into ‘Japanese new religions’, and pretty much one of the first things that came up was concerning some anime movies that Happy Science had produced to show its beliefs; not so much as propaganda, but to act as information. 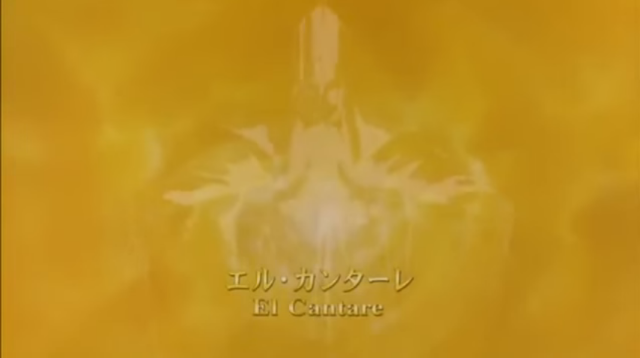 This, and spreading the message that a deity known as El Cantare is there for all of us, to shield us from greed and lust. Why the McDonalds anime commercial is the best commercial they’ve ever done. Right now here in the UK, McDonalds are churning out the usual factual commercials on how all of their burgers have British and Irish beef, how they embrace fresh ingredients, and about their new idea for putting books in Happy Meals (which on paper sounds great, but any kid would rather play with a toy). Their current ad campaign, though, focuses on how the assorted variety of customers have their “best times” at one of their restaurants (from celebrating a soccer match to finding your future wife), with an appalling piano cover of The Jam’s “That’s Entertainment” playing in the background. On the other hand, like some restaurant chains, they like to ignore the glaring rumours about how they treat their employees. Here in the UK, McDonalds employees are often on what’s called ‘zero-hour contracts’. In them, the employer (McDonalds) isn’t obliged to give out any minimum working hours, while the employee (the poor hapless kid with spots occasionally getting your order wrong) isn’t obliged to accept any work offered. Sounds great, right?……but the employee must also sign an agreement that they must be available for work when and where-ever, and there’s still no guarantee they’ll get the number of hours they signed up for, meaning it could be anywhere between 1 to 48 hours a week. With this, as well as the question behind whether their food is genuinely healthy (eg. due to the high amount of fat, grease and additives, a Big Mac can take up to 3 days to properly digest), McDonalds have been desperate to win peoples’ hearts for like forever. Everywhere in the world. And as in Japan, where at least one McDonalds (or McDonalds equivalent) is found on every block, this generation’s kids are happy that they won’t always have to subject themselves to traditional Japanese cuisine and can splash out on Western food, despite the fact that westerners themselves usually frown on their food. Tokyopop’s return part 2: The Plot Thickens. Well we have all been waiting with baited breath to see what Tokyopop really do have up their sleeves for their so-called comeback. I implied in my last Tokyopop post on how they had started talks with Disney for doing adaptations of Disney works; this would most likely mean the likes of Frozen or Star Wars or any of the Pixar movies appearing in print comic form. Head honcho Stuart Levy, who never gave up on Tokyopop even when Kodansha left them, several of their staff were fired, their German office was shut down and Borders (their largest customer) went bankrupt, has gotten himself into a bit of a corner, unfortunately. Do we want Tokyopop back? Well, Vice seem to think we do. I most certainly remember when Tokyopop manga filled the tiny tiny sections of my bookstore (and oh, were they tiny…considering how small the manga fanbase had hit the UK) with the likes of Fruits Basket, Cardcaptor Sakura, Sailor Moon, Battle Royale, Great Teacher Onizuka, Chobits, Cowboy Bebop…you name it, they most likely had the license for an English translation (make that an American translation, sorry). Not to mention the large number of original English and German-language works published, soundtracks, and licensed dubbed shows for TV. With the advent and increasing popularity of digital manga (as well as pirated/scanned manga & fan translations), it’s debated on whether we want an actual physical copy to read. This is, of course, a debate that applies with any printed media, from novels to newspapers…but why is the appeal of owning an actual manga volume to hold in your hands and read so large? Why manga in particular? Well manga publishers in the West, like Yen Press, Seven Seas and Kodansha have it nailed; hell it was Yen who introduced the concept of English-language light novels (feel free to correct me if I’m wrong on that one! ), which hit off much to my surprise. But a lot of people are extremely skeptical about Tokyopop’s return when they made their announcement back at both Anime Expo and San Diego Comic Con in 2015.